I’ve been a little down about my running life lately. Right before Christmas, I got the dreaded flu that’s going all around right now. It evolved to bronchitis (which I had never had in my life before) and me needing an inhaler just to go up and down my stairs for a few days. For someone who *was* either running or at the gym 5 days a week, let me tell you guys, it’s pretty humbling to realize that in just a few days you can be knocked down on your a$$ so completely that you can’t even make it up the stairs without being out of breath. It’s been a much longer recovery than I thought. I’ve tried only twice now to run outside. The first time I was with a friend and by the next morning, I was back at the doctor’s because I was having scary chest tightness. I was fine; he chalked it up to the combo of having been so sick and also having skiied in cold weather the weekend before. Apparently breathing in cold air for hours right after you get over a nasty bout of bronchitis is not the thing to do. Who knew? Everyone but me, apparently…. He prescribed “no outside exercise for two weeks!” and I resigned myself to run indoors. But then it hit 50 last weekend again and I couldn’t resist. Out the door I went. And again, in 50 degree weather, I felt like my lungs were swelling to the point that they were going to bust my rib cage out of my skin and I barely made it 3 miles at a totally slow-mo pace. To say I’ve been bummed is an understatement. 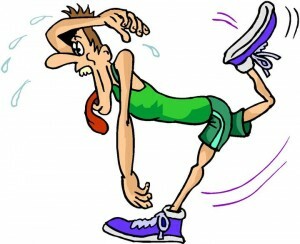 I know myself and slowing down on working out and running is a huge demotivator. So I pulled on my running shoes today with trepidation and headed to the gym. My plan was to run on the indoor track – not as nice as outside but hey, at least I’m moving in a direction. Got to the gym and realized I didn’t have my arm band. Which meant, I was either finding a class I wasn’t psyched about (there’s nothing good on Mondays) or running on the DREADMILL. I sucked it up and got on the treadmill. To my amazement, I made it 4 miles without any chest pain! I was slow, for sure, but really that’s more because I hate the friggin’ treadmill like no other. I’m always so scared I’m going to slip right off the back so I have to slow it down to feel like I’m control. But hey. I ran. And I felt great. As far as my #13in2013 goal, I’m nervous. But despite the brochitis, I knew there wouldn’t be many races run outside in January so I’ll have to double up some months in the warm weather. There’s one this weekend near me that I just found out about, but I’m only running it if I feel like it’s warm enough to do so. Just not worth it. Here’s to hoping I can keep up my running mojo indoors for the next few weeks though as outside doesn’t seem to cut it for me. It’s definitely going to be a challenge. Hopefully you had the flu shot. Vitamin D is a big help. Be very cautious for awhile before running any marathons. Recovery from the flu and bronchitis takes a lot longer than you think, even if you feel well. Listen to Auntie- good advice. Crikey Witney, you’ve got to be careful when it comes to flu, bronchitis and rushing back to running! This is when your lungs are at their most fragile so go easy. Stay in the warm and don’t push it too hard until you are 100% better. You’ll only set yourself back and delay your recovery! I don’t however advocate rushing out to get vaccines, not always necesary! Thanks so much for the comment, Zoe! I’m definitely being cautious about it – frustrated, but cautious! It’s crazy how long it takes to rebound! Flu shot or no?- that would be a good debate. My Mom never believed in them- especially considering the fact that a good friend of hers had one and became very sick with the flu as a direct result. So, we never had them growing up. Fast forward ,a few years ago ,after I recovered from pneumonia, my physician strongly recommended I have the flu shot. Took his advice and I have had one every year since. Jury’s still out as to whether to have or not to have. . I hear and read about others who, like my Mom’s friend, do get the flu with a shot and also hear about those who do NOT have the shot, and never catch it. Would be interesting to do a comparison study on this. . . I do still maintain that the practice of washing hands frequently, taking extra vitamin C and staying away from crowds during flu season is truly the best defense! Hey Witney. Great to hear how keen you are to get back to your running plans. Zoe is right, take the time to recover fully as this sort of thing can really knock you for six. It’s happened to me last year and I thought I was very fit and strong but it took me weeks to get back to full fitness. Sometime life throws up these curved balls just when we’re making progress, and then it seems we’re back to square one.. 4 miles with no chest pain is great. Sounds like you’re already bouncing back!